American Steel Foundries (ASF) has been a major producer of freight car trucks for over a century. To this day, ASF truck designs (specifically the "Ride Control" family) are a common sight under railcars all across North America. The ASF A-3 Ride Control 50-ton friction bearing freight truck was introduced in the 1940's and is one of the forerunners of modern freight trucks. Features embodied in this design include longer spring travel, no spring planks and constant friction control using friction castings in the bolster to dampen excessive lateral roll of the car. These design features allowed for a higher train speed with less danger of derailment than previous designs. ASF sold over 140,000 sets by 1949 and continued manufacturing them into the mid-1960s. This truck is excellent for modeling the transition era up to the end of the friction bearing era. The 70-ton ASF friction bearing truck with 33" wheels is from the post-transition era. Examples of 70-ton capacity cars built during this era would include 3-bay hoppers, 2 and 3-bay covered hoppers, mill gons and some flat cars. Railroads that bought this truck included: AA, ACL, ATSF, B&M, B&O, C&EI, C&O, CofG, CB&Q, CGW, CNJ, CNW, CRR, D&H, D&RGW, DL&W, DT&I, EJ&E, Erie, GM&O, GN, IC, KCS, L&N, LV, Monon, M&StL, MEC, MILW, MKT, MP, N&W, NC&StL, NH, NKP, NP, NYC, P&LE, PFE, PM, PRR, RI, SAL, SL-SF, SOO, SP, SP&S, SSW, T&NO, T&P, UP, Wabash, WM and WP. Starting in 1966, new cars were required to have roller bearing trucks. At the same time, older friction bearing trucks were gradually phased out (some were retrofit with roller bearings and the rest were scrapped when their cars were retired from service). Friction bearing trucks were banned from interchange service on 1/1/91 for cars carrying hazardous materials. All other cars equipped with friction bearings were banned from interchange on 1/1/94. 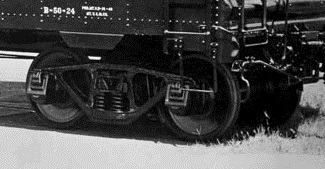 Cars with converted friction to roller bearing side-frames were banned from interchange on 1/1/95. A few exemptions to these rules were granted for shippers who could not comply with the dates, so some cars did linger a little longer in interchange after the actual deadline dates. The converted trucks were ultimately banned because hot bearing detectors could not "see" them when they overheated. Based on earlier solid bearing designs, the ASF Ride Control roller bearing truck is one of the most popular trucks of the modern diesel era. It is made with various spring packages and other options in 70-ton, 100-ton and 125-ton versions. These trucks are still being produced to this day and can be found under a wide variety of North American rolling stock.